The Tall Ship Manitou is a replica of an 1800’s “coasting” cargo schooner, similar to those that sailed the Great Lakes and the Atlantic Ocean. Specifically designed for passenger service, her hull was constructed in Portsmouth, New Hampshire in 1983 and finished by Vermont carpenters on Lake Champlain. 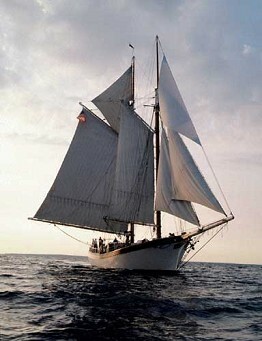 Manitou is one of the largest sailing ships on the Great Lakes. She was built specifically for passenger service, making her one of the most comfortable windjammers afloat. 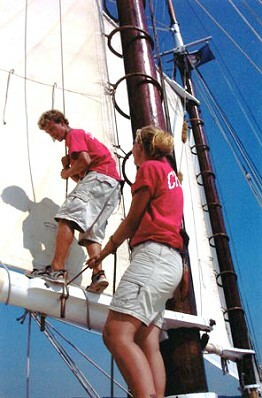 A traditional two-masted, gaff rigged, topsail schooner, she spreads over 3,000 square feet of sail and displaces (weighs) over one hundred tons. Up to twenty-four passengers can enjoy the pleasure and thrill of sailing aboard Manitou. Her licensed captain has many years of experience and together with the professional crew you can rest assured you're in good hands. Manitou meets or exceeds all U.S. Coast Guard regulations for construction, stability, safety equipment and electronics for vessels in passenger service. If the wind should fail, the sturdy diesel engine powers her swiftly to the next destination. 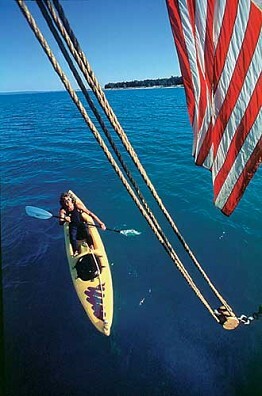 Because of her size and design she ensures a comfortable relaxing sail for all. You'll love the food on Manitou. Our healthy menus will satisfy the heartiest of seagoing appetites, with emphasis on Manitou specialties, fresh fruits, and produce of the region. Our team of cooks will delight you with bountiful home cooked meals turned out of the ship's galley. All of the cooking is done on our wood fired stove, "Cleo", and is served either family style in the main cabin or as a wonderful buffet on deck. Beverages such as juice, tea, and coffee are provided during meals. Soft drinks may be brought on board and stored in your cabin or in ice chests provided on deck.